Can enhanced circulation of African worldviews help shape the evolution of humanity? This is our vision at Langaa Research and Publishing Common Initiative Group which, along with other African publishers, stirs the imagination and contributes to cultural development and renaissance. Langaa books expose the conviviality, complexities, vitalities and predicaments of life in Africa and contribute to theory-building in the social sciences and humanities. In this short article, we highlight achievements and challenges of Langaa in the wider context of publishing on Africa. People ask how in 10 years Langaa has published 500 books, now in libraries and personal collections throughout the world. Langaa’s most important asset is its dedicated authors – hundreds of men and women, including young and seasoned scholars. Most are African; some are not. Volunteers around the world review, edit, proofread and format manuscripts and design book covers. In our editorial processes, we seek balance between investments in time and effort and the need to make manuscripts available in a timely fashion. 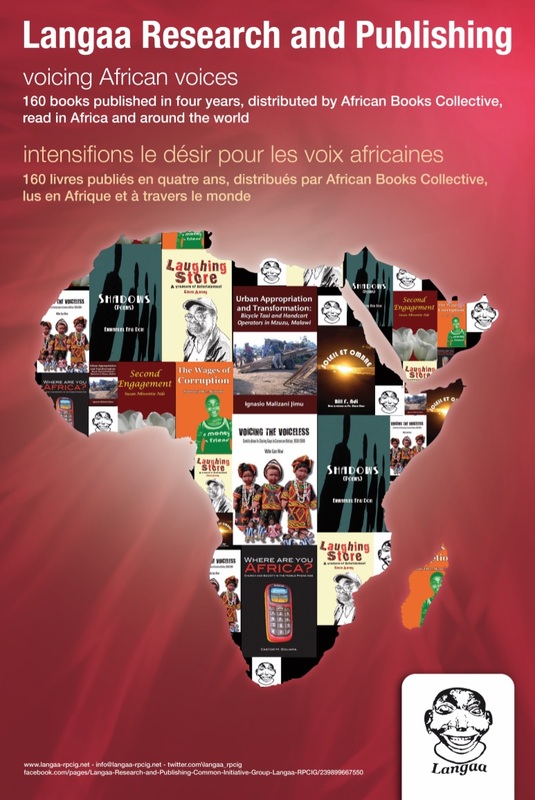 Through a partnership with the African Books Collective, Langaa books are distributed and read internationally, via print-on-demand and as e-books. Research and writing workshops at Langaa guesthouses in Bamenda and Buea in Cameroon and beyond nourish collaboration, for example with the Caine Prize for African Writing, Addis Ababa University, Kyoto University, Leiden University and University of Montreal. Answering the question of why Langaa was created speaks to the importance of African publishing and of Africans telling and reading their own stories. In 2009 Chimamanda Ngozi Adichie – born almost a half century after Achebe – describes a consequence of standing in one place by reading only American and British books as a child: “I did not know that people like me could exist in literature.” She goes on to explain how the discovery of African writers saved her from the danger of a single story. Langaa, which is based in Cameroon, was created to share multi-faceted voices on Africa, knowing that “education in Africa has been and mostly remains a journey fuelled by an exogenously induced and internalised … mission of devaluation or annihilation of African creativity, agency and value systems” (Nyamnjoh 2012). In channelling energies differently, Langaa mitigates the screaming deafness to African voices, often in contestation to prevalent stereotypical narratives about African realities and Africa and Africans in the world. Let us tempt the taste buds by sharing from several other Langaa books. The edited collections by Fatou Diop Sall and Ramata Molo Thioune (2012) and of Thioune and Rosnert Ludovic Alissoutin (2014) reveal – in French – rural women’s struggles for access to land and water for agricultural purposes in Senegal and beyond. In 2015 Mary Njeri Kinyanjui wrote about hierarchies of privilege and power by telling the stories of her grandfather in Kenya who “knew each of his coffee trees” and of her aunt who knows how to keep everyone engaged on the seven-mile trek to the factory. This US$15, 32-page reflection on paradoxes and distortions, titled Coffee Time, is almost a treatise on development and could be used to encourage critical thinking in undergraduate courses in the United States and Europe where students apparently spend so much time at Starbucks. Excerpts are available via Google Books. In the 2013 edited collection Boundaries and History in Africa, Professor Verkijika Fanso wrote about researching African history and integrating it into the curriculum from 1974 when “neither Cameroun nor African history was really taught” in the department of history at the University of Yaounde. Since then, countless other researchers have expanded inquiry into African history and society. Ignasio Malizani Jimu (2008) conducted a fascinating and insightful in-depth study of bicycle taxi and handcart operators in Malawi. Yanyin Zi (2017), in writing about China shops in Botswana, suggests that as globalisation permeates everyday lives, each person is “empowered to be an ‘ambassador’ in shaping international relations”. Castor Goliama (2010), a Tanzanian priest, explores mobile phones in Africa from a theological perspective, while Crystal Powell (2012) shares her essays on perceived abilities of technology to both enhance and destruct social relationships. Blurbs and reviews of all Langaa books are available on the Langaa website, visited now more than 3,000 times per month. New books are announced on Facebook and Twitter. One of Langaa’s most important challenges is making its publications more available in Africa where, ironically, African canons and concepts have been repressed and are languishing in hiding and neglect, and textbook publishers predominate. Another challenge is reliance on volunteerism. Langaa may need to engage staff to coordinate volunteers, enhance community-building through activities in the physical and virtual worlds, and develop partnerships and write grants and reports. Africa is so rich. African experiences are imbued with teachings about life. African writing and writing on Africa is tremendously insightful and thought-provoking. We need to strengthen African publishing. We need to read and write and actively support reading and writing. We need to encourage curiosity and ask questions. We need to promote langaa – a desire for knowledge. We need to value knowledge generation in Africa and from African perspectives. We need to support cultural engagement, not cultural estrangement. We need to mobilise different groups to contribute in complimentary ways to become fruitfully entangled with and mangled by African-grown knowledge. Professor Francis B Nyamnjoh, from Cameroon, is head of Langaa, professor of anthropology at the University of Cape Town in South Africa, and a prolific author of scholarly works and fiction. Langaa’s Dr Kathryn Toure has worked with the International Development Research Center of Canada and, among others, the Educational Research Network for West and Central Africa in Mali, Africa Online in Cote d’Ivoire, and, in the United States, Garrison School Cultural Center, and the University of Iowa. Goliama, C. (2010) Where are you Africa? Church and society in the mobile phone age. Bamenda: Langaa. Jimu, I. M. (2008) Urban Appropriation and Transformation: Bicycle taxi and handcart operators in Mzuzu, Malawi. Bamenda: Langaa. Kinyanjui, M. N. (2015). Coffee Time. Bamenda: Langaa. Mabeza, C. M. (2017) Water and Soil in Holy Matrimony? A smallholder farmer’s innovative agricultural practices for adapting to climate in rural Zimbabwe. Bamenda: Langaa. Powell, C. (2012) Me and my Cell Phone: And other essays on technology in everyday life. Bamenda: Langaa. Sall, F. D. and Thioune, R. M. (2012) Sénégal: Les femmes rurales à l’épreuve d’une citoyenneté foncière. Bamenda: Langaa. Temgoua, A.P., Abwa, D., Fomin, E. S. D. and Dze-Ngwa, W. (2013) Boundaries and History in Africa: Issues in conventional boundaries and ideological frontiers. Bamenda: Langaa. Thioune, R. M. and Alissoutin, R. L. (2014) Accès à l’eau pour les agricultrices sahéliennes: Enjeux pour une démocratie inclusive. Bamenda: Langaa. Zi, Y. (2017) Iron Sharpens Iron: Social interactions at China shops in Botswana. Bamenda: Langaa.